Used Knoll Cubicles for Atlanta, Charlotte, Nashville, Raleigh, and the Entire U.S.
With an emphasis on sustainable design, Knoll cubicles are some of the most innovative and environmentally conscious in the industry. Panel Systems Unlimited specializes in gently used office workstations and carries a wide variety of used Knoll workstations in like-new condition. 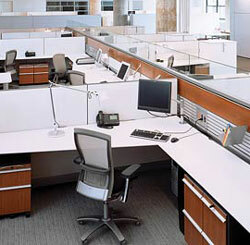 Our used furniture looks so pristine because we only select the workstations that pass our stringent quality standards. We begin with products that already look outstanding and then skillfully and painstakingly clean and retouch them until they display the superior appearance and durability that we are renowned for. No matter style or quantity you need, when you order used Knoll cubicles from Panel Systems Unlimited, you also receive space planning services from our design and installation team with more than 40 years of combined experience. Using CAD technology, we will create a detailed floor plan of your workplace and layout your furniture in a way that best utilizes your office space and improves workflow. In addition, we can take care of every aspect of the installation process, including workstation assembly, and even the liquidation of your old furniture. For information on our selection of Knoll cubicles and other used office cubicles for Knoxville, Greensboro, Savannah, Columbia, SC, and beyond, contact Panel Systems Unlimited today.